Since 1978, the Spirit of Norfolk has delivered a vibrant and unique combination of dining, dancing, entertainment and breathtaking views. 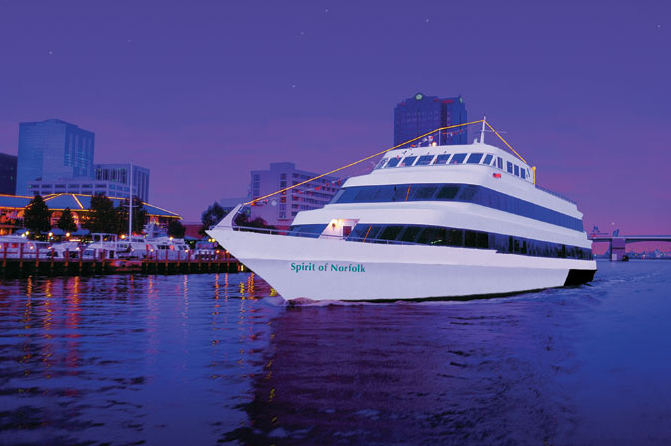 Cruising year-round from The Waterside in Downtown Norfolk, Spirit Cruises offers Lunch, Brunch, Dinner, Cocktail, Moonlight Cruises and much more! Grand buffets. Breathtaking views of Norfolk harbor and the Navy's Atlantic Fleet. DJs playing Top 40 hits. And an amazing wait staff singing show-stopping favorites. All included for one price. For your next special occasion or just an engaging way to see Norfolk, come aboard today!